An unusual case of simultaneous bilateral stress fractures of the distal tibia and fibula in a 45 year old white woman is described. The onset of symptoms was not associated with a specific episode of trauma, sporting activity, or identifiable inflammatory predisposing cause. Her bone density scan, bone profile, and biochemistry were all normal. Although stress fractures are well recognised, bilateral distal tibial and fibular fractures are particularly rare. A high degree of awareness is required for early diagnosis. A 45 year old white housewife presented to the rheumatology outpatient clinic with a three month history of bilateral ankle swelling with pain. This was treated with a diuretic, which reduced the swelling but not the pain. She had a little difficulty in climbing stairs, and her walking distance was reduced to 200 metres from her normal distance of 2 km. She took no alcohol and had a smoking history of 25 pack-years. She had a past history of hypothyroidism, had had a hysterectomy at the age of 35 for menorrhagia, and was receiving thyroxine and hormone replacement therapy. There was no past medical history of fracture or family history of metabolic or genetic bone diseases. On examination she looked generally well, had a normal physical build, and was clinically euthyroid. Her weight was 80 kg and her body mass index 25 kg/m2. She was normotensive and there were no abnormalities on systemic examination. She had pain on inversion and eversion of the subtalar joints bilaterally and her ankles were tender on palpation. She had bilateral valgus deformity at the ankle joint. There were no other joint abnormalities. 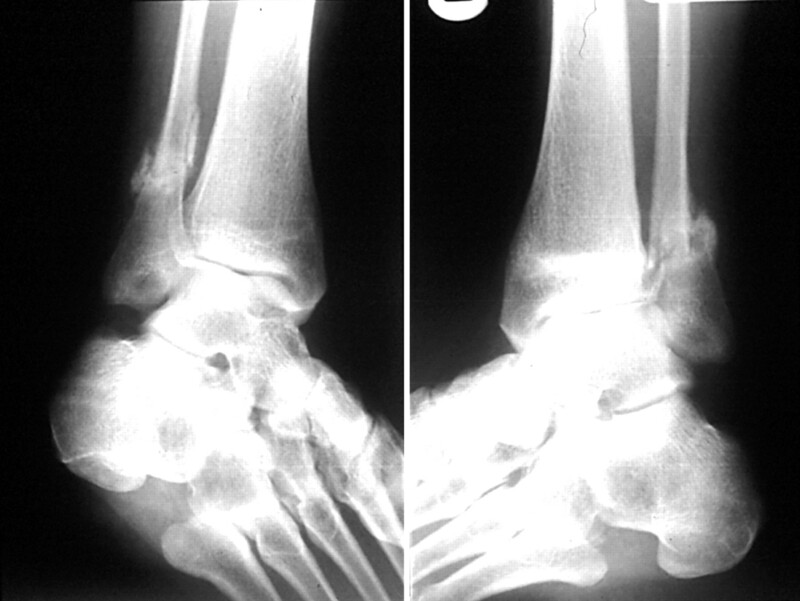 An x ray examination of her ankles showed bilateral distal tibia and fibula stress fractures (fig 1), and a bone isotope scan confirmed increased distribution of the stress fractures. Serum 25-hydroxyvitamin D, parathyroid hormone, thyroxine, thyroid stimulating hormone, urinary creatinine/dipyridinoline ratio, bone-specific sialoprotein, acute phase response proteins, serum protein electrophoresis, follicle stimulating hormone, luteinising hormone, and bone, liver, and kidney profiles were all normal. Bone density measurements were normal. Surgery was not recommended and she was advised to reduce her activity and rest and to use mechanical supports and analgesics; this resulted in successful symptomatic improvement. She was also advised to stop smoking. Healing distal fibular and tibial stress fractures. This case shows that pain and swelling localised to the ankles, associated with poor mobility, should alert doctors to the possibility of stress fractures in a patient with a history of heavy smoking, and amenorrhoea. Early recognition and diagnosis of stress fractures is important in helping to ameliorate the pain and disability they cause. Alonso-Bartolome P, Martinez-Taboada VM, Blanco R, Rodriguez-Valverde V. Insufficiency fractures of the tibia and fibula. Semin Arthritis Rheum1999;28:413–20. Boden BP, Osbahr DC, Jimenez C. Low-risk stress fractures. Am J Sports Med2001;29:100–11. Carpintero P, Berral FJ, Baena P, Garcia-Frasquet A, Lancho JL. Delayed diagnosis of fatigue fractures in the elderly. Am J Sports Med1997;25:659–62. Matheson GO, Clement DB, McKenzie DC, Taunton JE, Lloyd-Smith DR, MacIntyre JG. Stress fractures in athletes. A study of 320 cases. Am J Sports Med1987;15:46–58. Pease CT. Insufficiency fractures of the distal tibia. Br J Rheumatol1994;33:1056–9. Maenpaa HM, Soini I, Lehto MU, Belt EA. Insufficiency fractures in patients with chronic inflammatory joint diseases. Clin Exp Rheumatol2002;20:77–9. Wei N. Stress fractures of the distal fibula presenting as monoarticular flares in patients with rheumatoid arthritis. Arthritis Rheum1994:37:1555–6. Buskila D, Gladman DD. Stress fractures of the legs and swelling of the ankles in a patient with lupus: a diagnostic dilemma. Ann Rheum Dis1990;49:783–4. Ross DJ, Dieppe PA, Watt I, Newman JH. Tibial stress fracture in pyrophosphate arthropathy. J Bone Joint Surg Br1983;65:474–7. Stanitski CL, McMaster JH, Scranton PE: on the nature of stress fractures. Am J Sports Med1978;6:391–6. Meyer SA, Saltzman CL, Albright JP. Stress fractures of the foot and leg. Clin Sports Med1993;12:395–413. Friedl KE, Nuovo JA, Patience TH, Dettori JR. Factors associated with stress fracture in young army women: indications for further research. Mil Med1992;157:334–8. Lappe JM, Stegman MR, Recker RR. The impact of lifestyle factors on stress fractures in female Army recruits. Osteoporos Int2001;12:35–42.